Earning a master’s degree can open the door to leadership and management positions that might not be available to a bachelor’s degree holder. But once you decide to go to graduate school, the next big choice is choosing your degree program. Many students who want to further their education with a business-related master’s degree ask me how Peirce’s master’s degree in Organizational Leadership & Management differs from a MBA program. To put it simply, most MBA programs focus on traditional methods of business management with a quantitative approach. While programs vary, they usually place emphasis on statistics, economics, and business management. Conversely, a master’s degree in Organizational Leadership & Management provides more contemporary methods of managing through motivation, commitment, inspiration, and communication. The primary goal of the program is to prepare students for successful careers in organizational change, consultation, leadership, and management. But this just cracks the surface of these programs and the benefits graduates will reap from each. We’ve detailed some of the key points below. Graduate-level education and preparation is essential for career advancement in a wide variety of fields. MBA and MSOLM programs both prepare individuals for roles in management and leadership and serve as premier graduate experiences for emerging leaders. Each one of these programs provides individuals with credentials that are highly recognized by employers. MBA: These programs generally require an undergraduate degree with a concentration in a business field, as well as some management/leadership experience. They usually require the completion of the GMAT entrance examination. Some MBA applicants also need to complete a bridge program of undergraduate business classes prior to admission. Peirce’s MSOLM: Our program is open to individuals with an undergraduate degree in any field. It requires an undergraduate or graduate GPA of 2.75 or above, a professional application and essay, and letters of recommendation. MBA: Ranges from 36-42 credits. Peirce’s MSOLM: 36 credits. Classes include Foundations of Contemporary Leadership Theory & Practice, Systems Dynamics and Change, Leading Culturally & Generationally Diverse Populations, and Strategic Management and Finance, among others. MBA: Many programs have specialized tracks geared toward leadership in specific business fields, such as finance, marketing, and project management. Peirce’s MSOLM: Has coursework and experience in management, leadership, motivation, finance, marketing, project management, and more. However, the program’s takeaways are more broadly based and applicable in scope and sequence. MBA: Due to specialized tracks for specific business fields, MBA’s prepare graduates for leadership in niche areas. Peirce’s MSOLM: The breadth of the program prepares graduates for leadership roles in a variety of fields. Graduates will develop strong business competencies, which is an important skill in almost every industry. But the program also includes elements of psychology, leadership, ethics, communication, and motivation theory. With this degree, graduates can go on to excel in a variety of careers, including those in business, healthcare, paralegal, non-profit, and higher education. We’ve also created this visual to better break down the similarities and differences between these program-types. 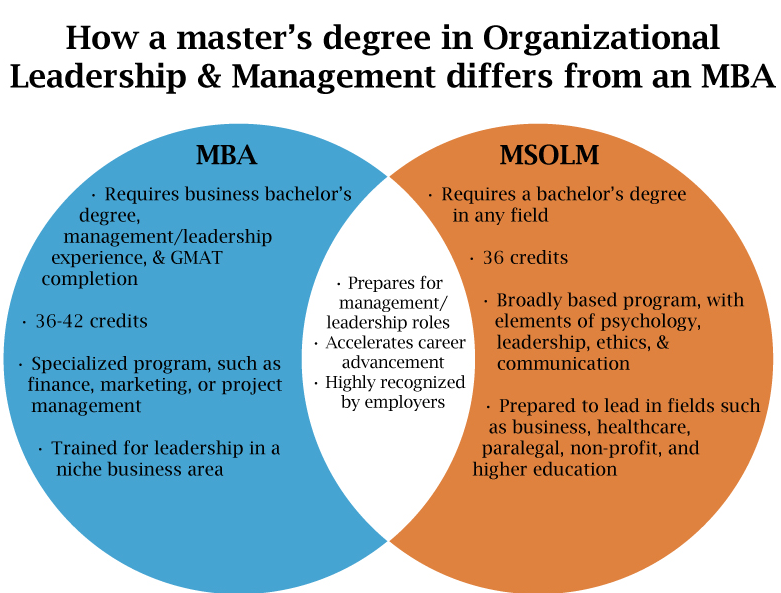 I hope that helps clear up the difference between MBA programs and our MSOLM program. If you have more questions, feel free to send me an email and I’ll be happy to answer them for you.